Many of my students this year have been working on auditory comprehension skills. They are working on listening to paragraphs and other short snippits of information, and then recalling the information, identifying key details, sequencing information and making inferences. 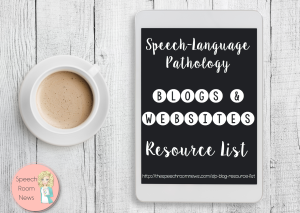 As academic content becomes more difficult, many of my students with language disorders have difficulty with these auditory comprehension skills, impacting their success in the classroom. My students were getting pretty good at completing these questions with my standard short stories and follow up questions. This week I decided to see how well they are transferring those skills! This is where it’s time to grab your Sunday paper ads! I had Target, Giant Eagle and Meijer. I wrote this little short story up about a lady running errands. She had 3 days worth of activities to buy items for. 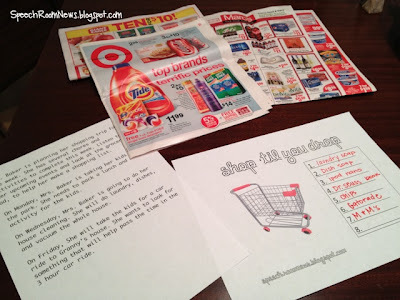 The student’s needed to listen to the activities, and then look through the ads and develop a shopping list. 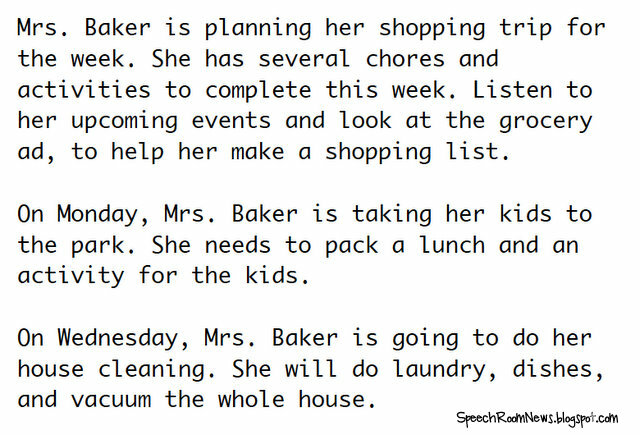 For example if Mrs. Baker needs to do the laundry, dishes and vacuum. She probably needs to make sure she has laundry detergent and dish soap. 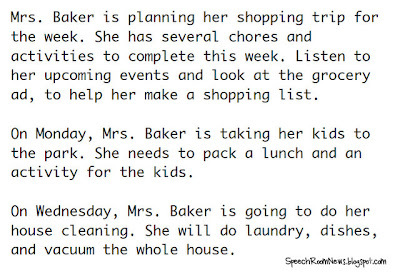 The kids had to recall the errands and chores and then make inferences about what she might need. It was a great activity to work on pulling out the key details presented. To follow up we compared our shopping lists. Students worked on some social skills, such as persuasion and negotiation to decide on a single list of appropriate items for the group. This is the printable I used for each student. As always in my room. Activities need to be flexible for all different groups! Here are 5 more ways I used the ads: 1. Students searched for items with their articulation sound 2. Find items that fit into a category (ie: electronics, vegetables, etc.) 3. Find items with a certain attribute (ie: noisy, spicy, etc.) 4. Find two things you would like to buy. Compare and contrast them. 5. Find an item. Give your neighbor clues, until they guess what you have on your wish list! 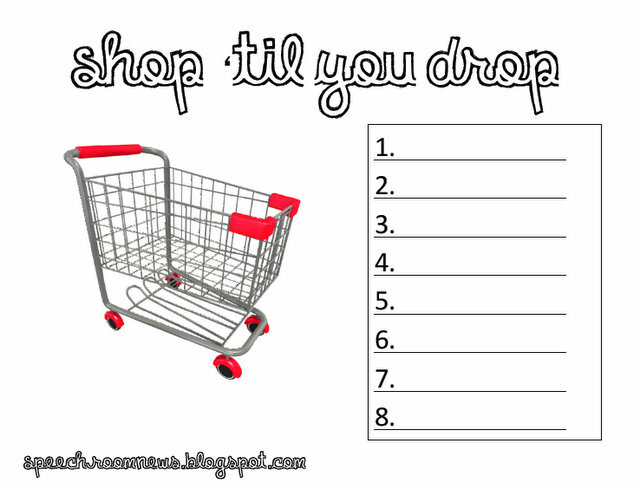 Grab your printables here! Story Example Worksheet What other ways can we use these ads? Thoughts? « You asked, I answer! HaHa! Got to love the free things! Any other ideas I should steal from you?! What a fabulous idea! 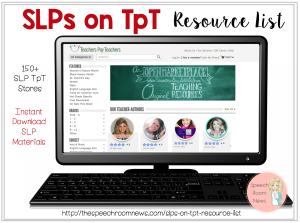 Thank you for adding the additional five ways to use this activity! Ha! I was just about to throw away some old ads but I hate to let good colored pictures of real life objects go to waste. Now I know what I can use it for!! what a great way to tie it all together using functional meaningful materials!! Thanks again! Yes..I love free materials that are functional and practical! I have used ads when doing a lesson on food groups. My students had to find pictures that fit each food group then I had them share with the group what they found. If they had certain artic targets I would give them a carrier phrase to use, such as “I found… (for the /f/ sound).” I think the ads could also be used when working on plurals, more/less concepts, same/different, etc. Thanks for the ideas as usual! Love this idea! So many ways you can use the ads! The past or present student’s required to pay attention to the actions, and then look through the ads and create a record. Love this! 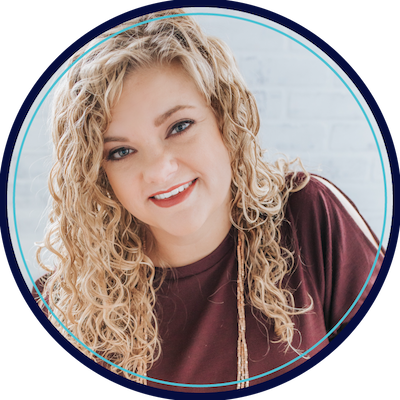 I’m a 3rd semester grad student, and I am placed in two settings: group TBI and group Aphasia therapies — both of which are far post injury and very high functioning. I can use this for both! I’m planning on using it today with the Aphasia group to target planning, budgeting, finding information (what items are not pictured that you can also buy on sale? how many bonus fuel points are you offered this weekend? if you only buy 1 of a 2/$5 will you still get the reduced price? ), problem solving (what if the item on sale is out?). I love the idea of using it with articulation!! Thank you for the great ideas!